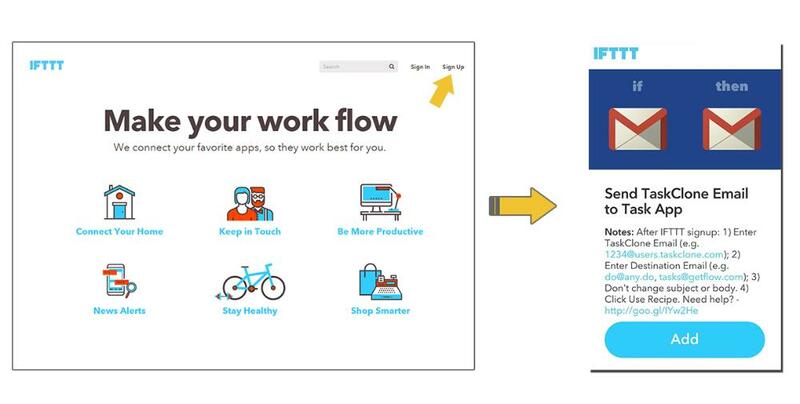 If our Supported Task Apps list indicates your app requires IFTTT Forwarding, please few this brief slideshow tutorial. IMPORTANT NOTE: As of March 31, 2019, Google deactivated the IFTTT functionality necessary for this to work. We are looking for alternatives and will modify this article when possible. See IFTTT Letter to integrators. What is IFTTT Forwarding and why would I need it? TaskClone sends tasks via emails from a special account created for you (e.g. 123456@users.taskclone.com). However, some task apps will only process incoming email from the personal address you used to register with their service (e.g. Any.do, Flow, Azendoo). Using Gmail and the free service IFTTT, we can get email from TaskClone into your task app. A Gmail account registered with your task app. For example, you’d need to login to Any.do using a Gmail address. This may require you change the address currently used with your app. Do I need IFTTT Forwarding? Once you select a task app during setup, you will be prompted to use IFTTT if necessary. See also List of Supported Task Apps. How much does it cost to use IFTTT or Gmail? Less than 5 minutes using this tutorial. Note: During TaskClone Setup, you will be prompted to sign up and configure IFTTT if your task app requires it. When prompted in TaskClone setup, enter the same Gmail used with your task app. To avoid task emails cluttering your Gmail inbox, filter emails from your TaskClone email into a Gmail inbox category (e.g. Updates). Learn how. IFTTT may take up to 15 minutes to forward emails from your Gmail account, but it usually happens in less than 2 minutes.